When I returned from a short vacation recently I had two Blu-ray's waiting for me from Netflix. At first I though there had been a mistake or I somehow accidentally switched my Netflix subscription from one-out-at-a-time to two. 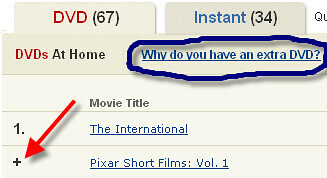 What I learned was it was just a little "bonus" from Netflix! 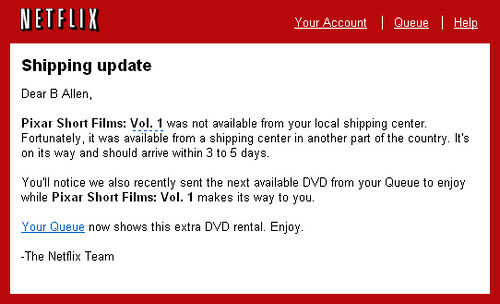 Now since I had been on vacation I didn't really realize my movie had been delayed, but it seems the policy for Netflix is to sometime send the next movie in the queue if the delivery of the top one will be delivered from a farther delivery point. HackingNetflix explained this policy on their blog and I had just missed the fact that Netflix was doing this - probably because it hadn't ever happened to me. Really a nice little extra from Netflix. I remember the day when it used to take 3 or 4 days to receive a disk so now that I receive it in one day I have to say I really love the service. And I'm watching a lot of Blu-Rays these days streamed from my HTPC server to my SageTV HD200 extenders which makes renting a really nice, easy solution. By the way, if you happen to go on vacation and are a Netflix subscriber - don't do what I did this time. Instead put your Netflix service "on vacation" and save yourself some money.